Toke Makinwa agrees dating is expensive. 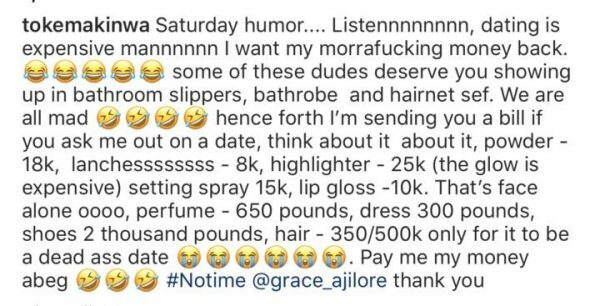 The media personality posted a video of a lady who says everyman she went on a date with needs to pay because it costs a lot to prepare for a date. She says it also hurts to rock a dress she can’t repeat, an expensive shoe and bag, hair just to go on a date and realize the man is useless. Corroborating her, Toke Makinwa gave a breakdown, saying some men don’t deserve the effort women put into going on dates. So, she is sending a bill to any man who asks her out on a date.